Many patients with stroke, head injuries or dementia suffer severe memory impairment and in many cases improvement may fail to occur. This book, first published in 1984 followed by this second edition in 1992, offers practical guidelines to the problems and is supported by a discussion of theory about memory systems and functioning. It should enable therapists and psychologists to recognize, understand, assess and manage memory problems arising from injury, accident or infection of the brain. The authors are well-known for their interest in memory and memory therapy. 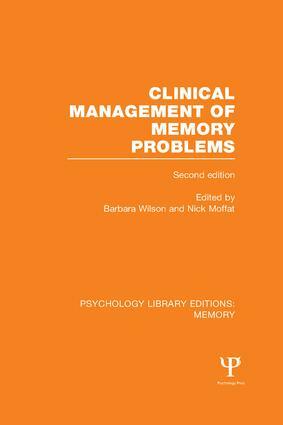 Topics covered in this text include: the relationship between memory and practice, assessment, methods for improving memory, organization of memory therapy, selection of appropriate treatments for individual patients, role of the microcomputer in memory rehabilitation, use of drugs in stimulating memory, development of programmes to improve attention and the treatment of the memory-impaired in groups. This second edition has an update on drugs, electronic aids and assessment procedures, with further evidence of the effectiveness of memory therapy. This book would have been an asset for those professionals involved in the rehabilitation of the impaired memory at the time and can still be of value today.